KABC-TV: Are You An Empath? Are you an empath? Do other people’s mood affect your mood? Do you prefer alone time to replenish yourself after being in crowds? Are you sensitive to noises, smells, and excessive talking? Or perhaps you’ve been told that you’re overly sensitive? In this ABC interview, I talk with KABC-TV in Los Angeles, about the characteristics of an empath as featured in The Empath’s Survival Guide: Life Strategies for Sensitive People. Empaths are highly sensitive people who can sense subtle energies, emotions, and physical symptoms from others and absorb that energy, emotions, and even physical symptoms into their own bodies. Being empathic has incredible benefits such as greater intuition, compassion, creativity and a deeper connection with other people. But living in this state of high sensitivity also comes with its challenges, such as becoming easily overwhelmed, overstimulated, exhausted, or absorbing the stress and negativity of others. Are you an empath? Take the test here. Judith Orloff, MD is the author of The Empath’s Survival Guide: Life Strategies for Sensitive People, upon which her articles are based. 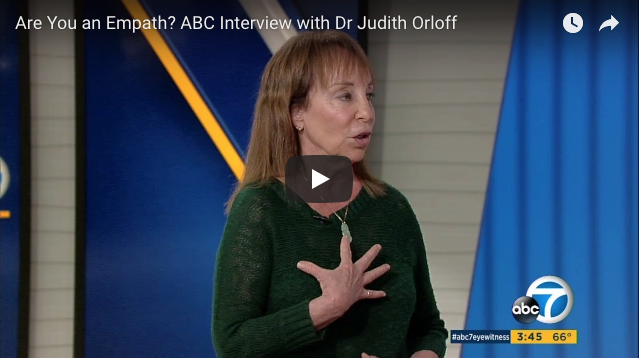 Dr. Orloff is a psychiatrist, an empath, and is on the UCLA Psychiatric Clinical Faculty. She synthesizes the pearls of traditional medicine with cutting edge knowledge of intuition, energy, and spirituality. Dr. Orloff also specializes in treating empaths and highly sensitive people in her private practice. Dr. Orloff’s work has been featured on The Today Show, CNN, the Oprah Magazine and USA Today. She is a New York Times best-selling author of Emotional Freedom, The Power of Surrender, Second Sight, Positive Energy, and Guide to Intuitive Healing. More information at www.drjudithorloff.com.